This marvelously compact pin select item is, essentially, one end of the 1138 Eight Stack Jungle. If you don’t need a big cable crossover or if floor space is limited, this cluster of workout stations offers two adjustable cable columns, a seated row and a lat pulldown station. 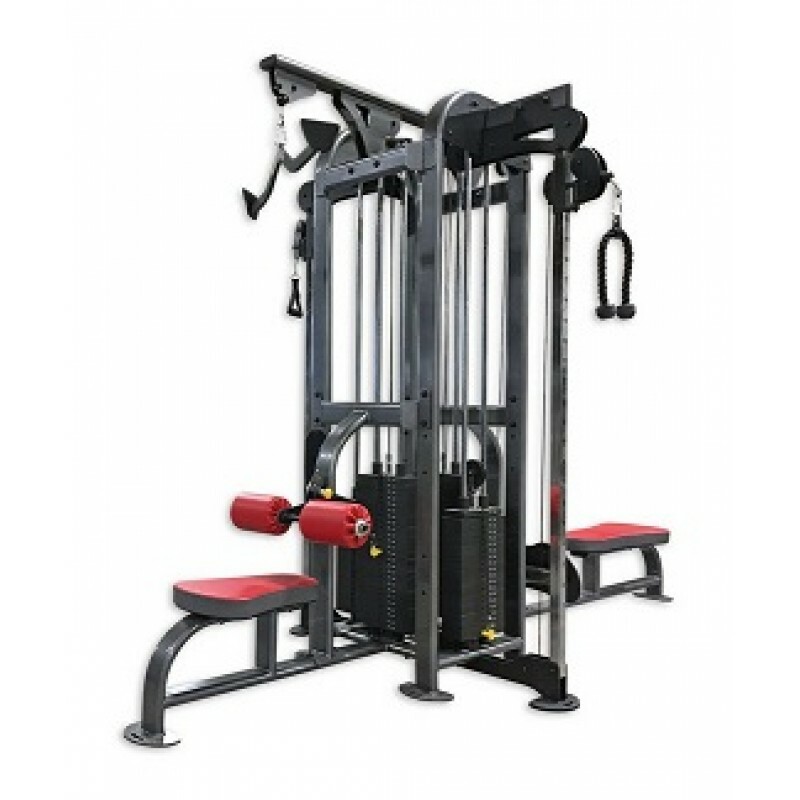 The adjustable cable columns have 200-pound weight stacks with 2:1 pulley reduction, and the seated row and lat pulldown have 250-pound weight stacks. Weight stack upgrades are available for the cable columns (250-pound and 300 pound), the lat pulldown (300-pound), and the seated row (300-pound). Patented MAG handles come standard on one of the lat pulldowns and one of the low row stations. MAG handles offer unique grips that make gloves and wrist straps unnecessary, even at higher weight reps. The web grip handles, split rope attachment, and curl bar can be used interchangeably and are sturdy enough to stand up to the toughest users. Built in the US like all other pieces in the Legend Fitness SelectEDGE line, the Four Stack has partially hidden, heavy-duty cables and a sleek, modern design. It is available in any of our numerous powder coat colors, with two-tone upholstery standard. All of the other usual SelectEDGE hallmarks of quality are there, such as high quality bearings, aviation-grade cabling, PowerMax pulleys, top-quality top-stitched upholstery and chrome adjustment surfaces. Seated row, lat pulldown, and two adjustable cable columns. Comes with patent-protected MAG handles, web grip handles, one split rope attachment, and one curl bar. Optional model number 1134DP offers dual-pulley seated row and lat pulldown stations (in place of MAG handles). Partially hidden cables and sleek SelectEDGE styling.